Artist’s impression of the 79 AD eruption as seen from Pompeii. Image is probably a screen-grab from the movie “Last Days of Pompeii”. The August 24th eruption of Vesuvius in 79 AD is the most famous and well-known volcanic eruption of all time. By now, volcanologists have pieced together the sequence of events to form a coherent and comprehensive picture and the only official dilemma is the actual date with meteorological evidence arguing a date towards the middle or end of September. Be that as it may, this is the history of the 79 AD eruption as it stands today. 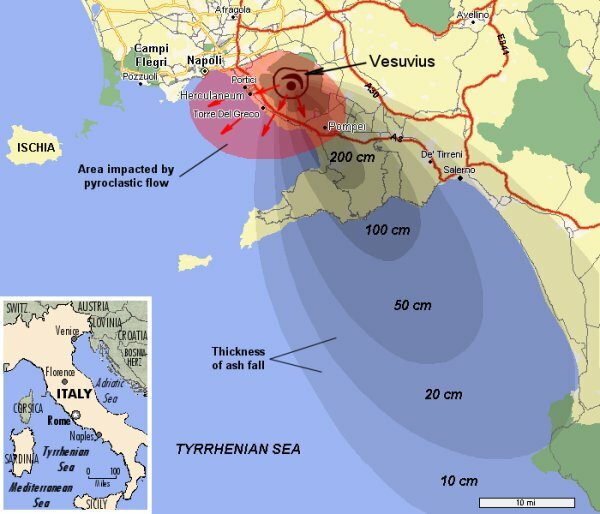 Seventeen years before the eruption, the Neapolis (literally New City) area was struck by a powerful earthquake which seems to have had its epicentre close to Pompeii as the destruction was heaviest there. There are reports of hundreds of sheep dying from tainted air, probably carbon dioxide poisoning, which argues that the 62 AD earthquake was a precursor of the 79 AD eruption. In 64 AD, the emperor Nero visited Neapolis and performed at the theatre. During his performance, another earthquake struck but legend has it that the emperor concluded his performance after which the theatre was evacuated and then collapsed. The initial eruption was phreatomagmatic in nature, i.e. “throat-clearing”, and resulted in a column of pulverised, old material at least 15 km high. The column eventually collapsed and later, during the night, pyroclastic flows began. The first one is believed to have been about 550C hot and engulfed Herculaneum, killing some 5,000 inhabitants including those who had sought shelter in the boathouses. Mercifully death was quick as their brains quickly boiled and their skulls exploded. According to Sigurdsson & associates, the eruption altered between plinian and peléan no less than six times. The main eruption when the eruption column is believed to have reached an altitude of 33 km and the peléan surges 4 and 5 that followed are believed to have been responsible for the destruction of Pompeii. Because of the greater distance from Vesuvius, about 11 km, the pyroclastic surges were not as hot at about 300C but hot enough to instantly cook the skin of its victims, effectively leaving them with third-degree burns covering 100% of their bodies, causing almost instantaneous death from heat shock. In the evening of August 25th, the eruption was over after some 30 hours. Google Earth(?) image of Vesuvius clearly showing the scarp of the pre-eruption volcano named Monte Somma. The 79 AD eruption has been assigned an “official” VEI of 5 but there are several reasons to doubt this. First of all, let us compare with the 1991 eruption of Mount Pinatubo! On July 16th 1990, the central Luzon was struck by a magnitude 7.7 earthquake which may have been a precursor to the eruption. On March 15th, earthquakes were felt by inhabitants close to the volcano and on April 2nd, phreatic explosions began and continued for several weeks. On June 7th, the first magmatic explosion occurred with an ash column some 7 km high. On June 12th, the large explosions began with a 30 min eruption which produced a 19 km high column and pyroclastic flows up to 4 km from the volcano. The next day, a 15 min explosion sent an ash column some 24 km high, then another eruption occurred lasting five minutes that produced a 24 km high column. The next day, June 14th, a three minute eruption resulted in a 21 km high column. On June 15th, Pinatubo was shattered by a cataclysmic eruption that lasted three hours and sent a 34 km high ash column skywards. From this description, it is clear that Vesuvius eruption was comparable to that of Pinatubo, especially if one considers the brevity of the several Pinatubo eruptions in comparison to those of Vesuvius. The main Pinatubo eruption on June 15th lasted for three hours and produced an ash column 34 km high against the at least six hours long Vesuvius main eruption that resulted in a column 33 km high. The figure given for the Plinian phase of Vesuvius 79 AD eruption is eighteen hours. The depth of the pumice and pyroclastic flow deposits, 20 metres at Herculaneum and 2.8 m pumice plus several metres of pyroclastics at Pompeii, 11 km from the volcano, are comparable. But the best evidence that volcanologists have (most likely) gotten it wrong comes from linguistics. Just to the north of the modern cone of Vesuvius lies a scarp or ridge of a much larger volcano named Monte Somma, which is sometimes claimed to be the result of the VEI 6 Avellino eruption dated to approximately 1800-1650 BC even if other sources suggest an eruption 17,000 BP as the originator. A study of the Avellino eruption reconstructs a minimum eruption time of 3 hours in which an initial explosion raised a column of 23 km which deposited about 0.32 km3 of white pumice while a second, more intense explosion, raised a column of 31 km depositing 1.25 km3 of grey pumice with pyroclastic deposits up to 50 cm thick at Avellino. As can be inferred from this reconstruction, the VEI 6 Avellino eruption was less explosive and the deposits were far less extensive and thick as those of the VEI 5 eruption of 79 AD. Vesuvius as it appeared prior to the 79 AD eruption as depicted in a mural discovered in Pompeii. In the image of the guy in the grape suit (Bacchus? ), there are what appears to be a few peripheral cones. Is it possible that these are along what was the ring fault that later made up the Somma’s collapse structure? If so, then it seems that Vesuvius as we know it is a significantly large resurgent feature. Heh… entertainment is where you find it. Evidently the first “Wing-man” was Silenus, a companion of Dionysus. Indeed it is possible to interpret the not very clear picture as showing peripheral cones and that these were aligned in such a manner. You could also interpret it as a spine feature surrounded by cones. Pliny the younger did report fire from multiple vents. Is it possible that Mt Somma was indeed the summit at the time and the current cone has only only become prominent since? Considering they have done core isotope dating I would be pretty confident with the caldera event being due to a previous eruption. El Chichon would be an interesting comparison since it was a VE5 that destroyed villages out to 7km with surges. Then Compare that to Novarupta (13km3) that produced tephra depths up to 210m thick from a 60 hour long eruption. Just remember Pinatubo erupted in the middle of a hurricane so much of the ash would have been blown away. The estimated hight of of the vesuvius eruption would also have been impacted by the amount of steam in the eruption due to groundwater. If the image is of Vesuvius, it could just be the cone, itself 😕 So what appears to be parasitic cones could be parts of the Somma caldera? It is actually possible to guesstimate the DRE volume of the eruption if one calculates the volume of mountain gone missing. To do this, you have to make a few assumptions: i) the pre-eruption mountain was a perfect cone, ii) the height of the pre-eruption mountain, iii) the diameter of the caldera left behind, and iv) the average height of the remains inside the caldera which forms the base of the assumed cone. If ii) is set to 2.1 km, iii) not less than 4 km, and iv) 600 m (the assumed height of the post-eruption peak ) using the geometric formula yields a result of 6.28 cubic kilometres. Since the figures used are minimum or lower-end figures, the result makes a complete mockery of estimates that place the 79 AD eruption at the lower-end of a VEI 5. Don’t forget; don’t get too carried away with the volume of the edifice. That’s dense *cold* rock; it says little or nothing about the volume of *magma* DRE. Mike, I think you may be confusing this with the relationship between DRE and the volume of ash/pumice where 1 km^3 of the latter corresponds to between 0.3 – 0.4 km^3 DRE. In fact, the volume of the (collapsed) cone gives a fairly accurate ball-park figure for the amount of magma ejected. In reality, the figure ought to be even greater as a lot of the matter left at the bottom of the caldera is/was freshly ejected and there, we’re talking about a cylinder for which every 100 m of depth corresponds to ~1.2 km^3. The DRE includes the pulverised rock of the mountain. It is certainly not all magma. That is true for all such eruptions. For comparison, if you take an asteroid impact, the crater is 20 times the size (linear diameter) of the impacting asteroid. It shows that only a very small part of the ejects are from the asteroid. The asteroid plays the role of the magma here. Interesting. I’ve never before considered that cold edifice could be considered part of the eruption DRE calculation for VEI determination. It contains no gas and thus contributes nothing to the *energy* of the eruption – beyond the pure mechanical energy involved in e.g. a flank collapse. The extreme end of that I suppose would be something like the kind of event that – it’s postulated – *could* take place in Hawaii or most especially at Cumbre Vieja; there a relatively tiny volume of magma in eruption could directly cause a very large mass-wasting event that would turn a VEI 1 into a VEI 7 or 8 on pure volume of rock. Thank you Henrik for this illuminating article – wow – a VEI 6! Given the size of Vesuvius as postulated it is interesting that it continued to erupt so continuously on and off up until the 1940s – and that it has remained quiet since then. It was a truly awesome event in AD 79, captured (to some extent I’d like to think) in Robert Harris’s novel Pompeii which has consistency with Pliny’s reports. It had apparently been quiescent for hundreds of years before AD79 so that people did not even suspect it might be a volcano like Etna. Alyson, it is not a fact. All I am saying is that to me, it appears that the current estimate that the 79 AD eruption was a lower-end VEI 5 appears to be a gross under-estimation. However, it would not be the first time an ancient eruption was upgraded as relatively recent investigations of the submarine deposits at Santorini raised the appraisal for the ~1650 BC Thera eruption from a VEI 6 to a VEI 7. One caveat I would say is that I would personally guess there to be a greater chance that they greatly underestimated the size of the ancient eruption of Monte Somma. With that said, I do think the 89 ad eruption was perhaps larger than a VEI-5. Measuring the caldera / collapse scarp of Monte Somma, I would generally guess / assume it was a large VEI-6 sized eruption. I say this from the simple fact that the rough size of the caldera is larger than the caldera of other VEI-6 eruptions we’ve seen more recently. Those include Novarupta, Pinatubo, Santa Maria, and a few others. The collapse scarp is roughly similar in size to the caldera of Changbaishan, which erupted with a VEI-7 roughly 1000 years back. How do you know that the mural in Pompeii is of Vesuvius and not of another volcano, or a generic cartoon depiction? It is not my interpretation, Karen. If you look around the web where this picture is displayed you will see that is ubiquitously presented as depicting Vesuvius. Take this article in the Guardian as an example! That museum is a marvel. Well worth the effort if you are in Naples. Not necessarily. As far as I can tell, there is nothing on the picture that says Vesuvius or Somma – or, indeed, anywhere else 🙂 . As both Pompeii and Herculanium were wealthy trading centres before the AD79 eruption, there is nothing to say that the picture wasn’t a depiction of somewhere else (source of a wine for a wine trader, someone’s holiday pix, etc). OTH, I checked out Vesuvius on GE a while back (when I first saw the picture in a BBC program); you could almost replicate the view. But whatever it is a picture of, can’t be very high, unless those trees were unusually tall. From memory, Pliny the Younger does not describe a caldera forming event for AD79. It is probably because the collapse would not have been visible from Misenum across the Bay of Naples, especially if one considers that much or it would have happened at night as well as the mountain itself being hidden by the Peléean pyroclastic surges of the latter stages of the eruption. Checked my volcano books, the cone was destroyed and a stub left. Also Pliny the Younger had to leave Misenum due to heavy ash fall. If there is a record of how high the original cone was and how high the remaining stub was, you could calculate the size of the eruption. The Mastin et al forumla, the application of which Lurking excels at. Might be best to use that. Other sources attribute the formation of the Gran Cono to the AD79 eruption. As requested. With only two data points, I assumed a linear interpolation between the 33 km start and the 15 km finish. This is most likely incorrect due to gaps in witness accounts, but it is a decent ball park estimate. This method both over and under estimates the total volume ejected. Based on ash cloud height, I get a volume of about 1.26289 x 109 m³ DRE. Formula from Mastin et al. “A multidisciplinary effort to assign realistic source parameters to models of volcanic ash-cloud transport and dispersion during eruptions” (2009). 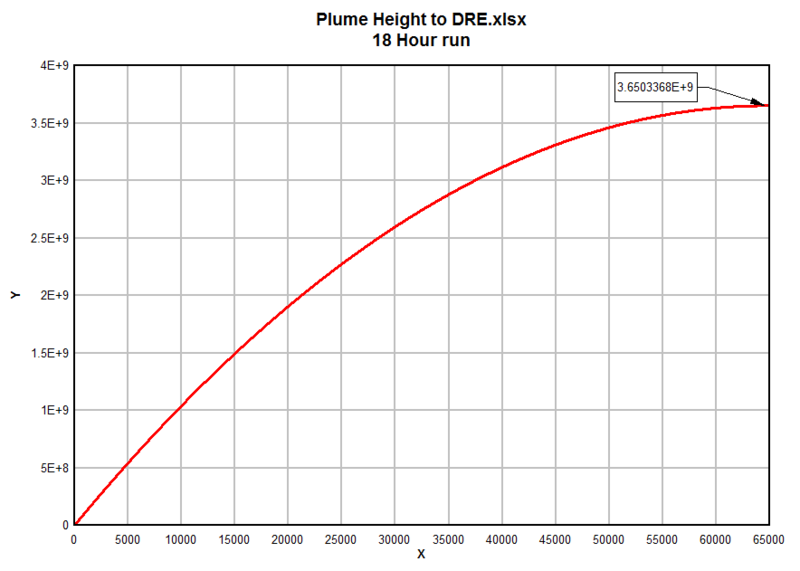 Mass rate for the 33 km plume → 11268 m³/s Mass rate for the 15 km plume → 4275 m³/s. Curve plotted in Dplot, linear interpolated to a one second increment, then integrated to find total mass. Remember that this is based off of TWO data points. There is a lot of room for slop. What happens if you extend the time period to 18 hours with a column height of zero above the volcano? *zero at the end of the 18 hours. I’m glad you brought that “above the volcano” part up. 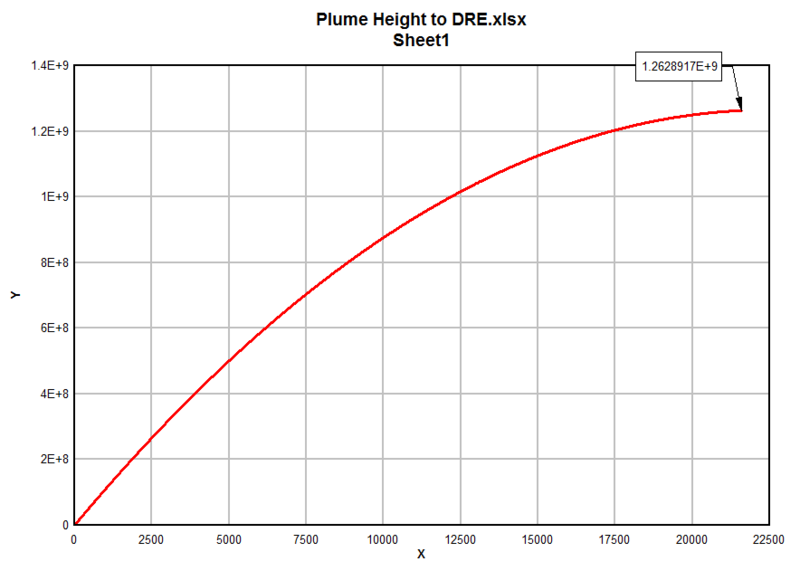 Mastin et al is based on the plume height above the edifice. I just used a straight 33 km start height and did not back out the (unknown) height of the original mountain. This is another source of potential error and leans toward an over estimation of the total mass ejected. What is important is to remember that this is just a ball park figure based on spotty witness accounts from 1900+ years ago. If there was a lateral blast component, that would make the estimates low. If the witnesses over estimated the plume height, that would make the estimate high. It is customary, in scientific circles, to quote the result with significant digits indicating approx accuracy. So “Based on ash cloud height, I get a volume of about 1.26289 x 109 m³ DRE.” suggests amazing accuracy but better might be “perhaps around 1 km³ “! Sorry to be a bit picky but …. The pickiness is appreciated. I present the number as generated by the software. Your observation is spot on. The apparent precision of the output is fully bogus. To add to the issue, I would also like to state that the Mastin et al paper specifically states that the actual result can vary by a factor of four. No matter how you look at it, this is nothing more that a very rough estimate. And, if you refer to the plots in the paper, you will note that their regression and the Sparks equation both show quite a bit of variation from the individual samples. This means that the number I came up with can easily be very low compared to what actually happened… 1900 years ago. How much ash landed in the Bay of Naples? Tsunamis were reported. Pyroclastic flows have been proven to be linked to tsunamis as have debris avalanche flows. Without reading the article (thanks for the link, I promise I will once I have the time), limestone is Calcite which if heated breaks up into Calcium Oxide and Carbon Dioxide (common human industrial process), the latter being a volcanic gas. So yes, it is possible even if carbon dioxide is nowhere near as “powerful” as water when it comes to driving a volcanic eruption. The article speaks of dried-out wetlands. One possibility I would suspect would be an underground methane or peat-fueled fire. It’s certainly not volcanic! Some very good comments and observations here; a good, healthy discussion. 🙂 Thank you Lurking for the Mastin calculation! Now, for the Plinian phase there were two figures available – maximum height and duration. The gradual decline plus the final figure of 15 km are my assumptions. We do not know for how long the eruption was strong enough to support the column above 30 km, 25 km, 20 km etc. For all we know, the eruption could have been strong enough to support the column at above 30 km for a couple of hours or more and that as the end of the given six-hour period, it immediately collapsed from, say, 27 km. Thus my assumption which Lurking worked his Mastin magic on is very much a minimum estimate. I am rather busy right now but if those thicknesses are about right a much better estimate could be obtained by estimating the quantity of ashfall. The pyroclastic area should also be amenable to an estimate although I suspect this was more of a flank collapse than column collapse. The Somma caldera could have protected the areas to the north from PCFs, which implies that it was there before the AD79 eruption. BTW we know from Pliny the Younger that the ash also went as far as Misenum to the west. And that the cone lay partly or wholly within the caldera. Karen, we know from the ash distribution that the wind was from the north which would have pushed the eruption column to the south so that when it collapsed to form PCFs, they would be predominantly to the S – as observed. Also, compare with the 1980 St Helens eruption where the PCFs went almost exclusively in a NE direction from St Helens. Furthermore, with an extremely large PCF such as the one that buried Pompeii, the Somma scarp would have been insufficient to protect the area to the north. I thinks it’s pretty safe to say that the reason no large PCFs have been discovered to the N and NE is because there were none. When you are actually in pompei, and even more so from vesuvius summit, one is struck by how far away vesuvius is and how much more-or-less level land lies between the foot of the volcano and the town. One really isn’t surprised that they felt relatively safe. You assume that the Vesuvius cone existed before 79AD. That may be the case but is far from clear. The current come may have started with the 472 eruption. The distinction between Vesuvius and Somma dates from after 1000AD: before that time the entire region was named Vesuvius. It does seem to me that the name Vesuvius was transfered to a new cone, leaving Somma temporarily unnamed (pretty much as you suggest). A description of Vesuvius from before the eruption described a flattish top, more like a caldera. The frescoes may have been of the current Mount Somma, the highest point of the caldera ring. I recall that similar reconstructions of Krakatau were made based on the shape around 1800, and these postulated a very tall cone which we now believe never existed. What this means for the DRE: still quite significant. Instead of a kilometer of tall cone, you blow out a large hole. Lurking’s calculations suggest at the very least 1km3, likely several times more. What of the ancient records that say Vesuvius was a far greater mountain (than today’s cone) such as the Greek “Strabo the Geographer” (63 BC)? How does Scherillo refute those? What of the landslide that was large enough to put the port town of Pompeii a couple of kilometres inland? How does Scherillo explain that away? Although I grant that his interpretation of the mural as a depiction of Monte Somma is clever, the images b) and especially c) are very good illustrations of how the post-79AD caldera would have appeared. Mt Pinatubo June 15th, 1991 – Plinian VEI 6, altitude 34 km, duration three hours. Strabo writes that ‘of the summit, a considerable part is flat’ (see the paper above). It is not clear from that that there was a large cone! It is open to interpretation. He describes an ashen, soot surface with pre-like cavities. A bit like Solfatara, perhaps. Scenario A – before the 79 AD eruption, Vesuvius was already a caldera and the eruption was mostly an intra-caldera affair. Scenario B – before the eruption, Vesuvius was a substantially larger volcano that collapsed to form the “Monte Somma caldera”. I have always favored option B. Mostly because of the fresco illustration in this article. that seems to be ignored. Most people who picture Vesuvius tend to use one of the south pacific volcano memes. Sometimes I take time to drive the slopes of Veeder. Up close there has been a lot of weathering. Canyons and such. There are outcroppings that look much like the illustration in this article. Veeder and Diablo sit perhaps 20 miles or so apart. Yet are completely different. I once attempted to locate the summit of Veder The roads however are private and owned by some of the most famous names in wine and sparkling (can not be legally called champaign) variants. The point is that, without field work. It is impossible to conclusively determine what one is looking at. Anyone looking at Diablo, says blown out Caldera with it.s north and south peaks. Diablo also is a lone mountain, rising from below sea level to close to 4000 feet. So it dominates this part of the state. Still looking at the illustration of the vineyards and the so called summit, It and the other frescoes look almost identical to the areas here north east of San Francisco where the grape growing regions are. Even our back garden with it’s Italian Pergolas look like the gardens in the frescoes. The other thing to consider, is how much ejecta filed in the bay of Naples at the Harbor of Herculaneum which is now some distance inland. That mass had to come from somewhere. These are very valid points. I have no personal preference for model A or B. Either is possible. It is important to realize though that volcanoes change. Vesuvius’ cone may be old or it may be recent, but it would certainly have been different 2000 years ago. The Strabo reference can be read as refering to a small caldera, like to current one, or a large one within the Somma ring: it is not proven there was a cone similar to modern Vesuvius, but it is not excluded either. Such is life! But I find it very interesting that Mount Somma was not named as such before about 1000 AD. As Henrik points out, that is an important clue. The pyroclastic deposit in itself could easily have been 1-2 km3. There is always option C.
That Vesuvius had rebuild on the mt somma caldera of the VEI 6 eruption 18300 years ago, so it had become the main edifice. I don’t think Mt pinatubo should not be used as a comparison for tephra deposits since the climatic eruption occurred in the middle of a typhoon. Looking around at the pinatubo data seems to suggest an eruption height of 35-40km for continuous period of 12 from satellite data. 40km for twelve hours is a whole different ballpark to 34km for 3 hours (source http://pubs.usgs.gov/pinatubo/lynch/) I do suspect that vesuvius 79ad was most likely a solid VEI5 with destruction of a significant cone that left the stub of mt somma. as the highest point. I don’t think Naples would appreciate that. That’s a panic fest waiting to happen. Which regrettably, is something that will occur at some point. I know Roddenberry would object, strenously, were it the latter. A few papers I’ve skimmed through mention a figure of 8 km3 bulk volume, others 4 km3 DRE. Not sure if this helps, but I would like to point out that a significant portion of the Gran Cono was destroyed in the 1.1 km3 (according to the VOGRIPA database) 1631 eruption, and the cone has regained all the volume it lost in the few centuries since then, I would also imagine the AD472 eruption did the same as it produced a similar amount of tephra. To me this suggests the volcano can grow very quickly. The last VEI5+ eruption prior to AD79 was the Avellino eruption some 2500 years earlier. Perhaps this means that in AD79 there was an older version of the Gran Cono which could’ve been larger than the current one, maybe even making the valley between the cone and Mount Somma less prominent than it is today? Sort of like the very narrow gap between the lava dome and old edifice of Bezymianny. If this was the case, then maybe the Somma edifice appeared as an outcrop on a somewhat symmetrical mountain (comparison to Popocatepetl perhaps?). The painting shows a rough edifice, maybe this is why? Anyway, I’m a total novice so maybe I’m way off. Maybe we’ll never know the answer for sure. I think this is close to what Henrik proposes. The roughness of of the cone on the painting, if true to life, means that the depicted part was old and has not erupted for a long time. If you (generic) want evidence of how fast a volcano can grow, look no further than Mt Shasta which about 10 kA BP and inside two centuries produced the parasitic Shastina cone easily as large as Vesuvius. Also Anak Krakatoa is currently taller than Krakatoa was before the eruption in 1883 which removed it from the map, and is still growing with aprocs 5m each year. Sure it isn’t as large as Vesuvius but it still gives a clear impression of how fast those things can grow. Anak Krakatoa is not taller than the original Krakatoa. Original Krakatoa (prior to the late 1800’s,) was over 600 meters tall. The current Anak Krakatoa is only close to 200 meters tall. Sorry my mistake, I’ve totally misread things, you are right. that we had to go between the peaks of Shasta/Shastina. Charts on the ceiling turbulence- did it once. That too (Black Butte) was erupted at (almost) the same time. 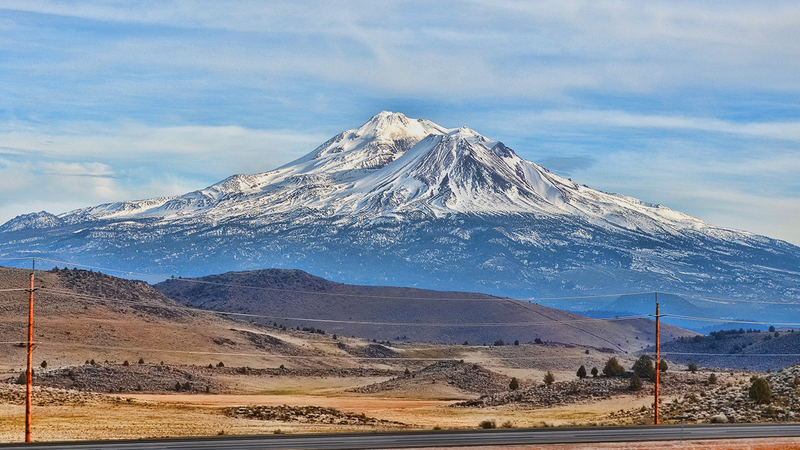 In addition, Shasta built itself a new summit as well. Wouldn’t mind that at all…. Henrik, consider this an official request. What happened to Naples in the AD79 eruption? Does anyone know, or is it too built up now to investigate? Despite it’s not appearing on any of the maps, we know that the ash cloud extended as far west as Misenum – enough to give the Plinys a bad time, so presumably Naples got some ash too. The Naples region was fine in 79ad but received pyroclastic flows in the previous large eruption. A really deep 2.4 mag quake at Katla with a depth of 31.9 km. Would this be a magma movement our something else ? This is clearly a magma movement and a good one. If more earthquakes like this occur, then trouble is on the cards, otherwise its the unusual Katla deep quake prior to a future major eruption that so far no one knows when, but its getting closer…. I think we are not that far away. I would say it could be most likely within the next 10-15 years, but of course it could even more earlier. If a cone the size of the current Vesuvius cone were destroyed, that would be a volume of 0.4km^3. If the cone in AD79 had filled the Somma caldera and risen above it, it could have produced 7km^3. The above calculation are estimates based on further estimates of the heights, radii of the cone and depth of the caldera – so rough guestimates of a couple of possible scenarios. On the other hand one of my volcano books put the estimated VEI at 5.8. I think that’s about right- just short of VEI6, like the 1991 Mount Hudson eruption. I think Henrik has a point. Grimsvotn 2011 was a VEI4+ almost on the threashold of a VEI5, and just because the eruption was so short-lived, a day or two. But the force was definitively VEI5 (at least) and the column was only up 22km high. COnsiderably higher than the 10-15km of Eyjafjallajokull. Vesuvius eruption, having a column up to 33km high, if this is really true, make it a clear VEI6 intensity eruption, with a column as high as Pinatubo and clearly higher than Grimsvotn 2011. Another comparison. Mt St Helens, a VEI5 which blasted part of the volcanic mountain, rose up to 24km high, a clear VEI5. In this sense, Vesuvius eruption must have been at least as strong as Mt St Helens eruption. Yet another comparison, Vesuvius eruption should have been at least as large as the devastating Oraefajokull eruption in Iceland in 1362, which ranked as a VEI5+ or VEI6. But that one did not blasted the mountain and was also short-lived. So this makes Vesuvius eruption seem stronger than it, again a VEI6. On the other end however, Askja 1875 was a mid sized VEI5 and created a caldera, but that was triggered by a large volume of magma that rifted further north (like Holuhraun did) and made the caldera sink and erupted in a violent way. We can´t compare with this one then. 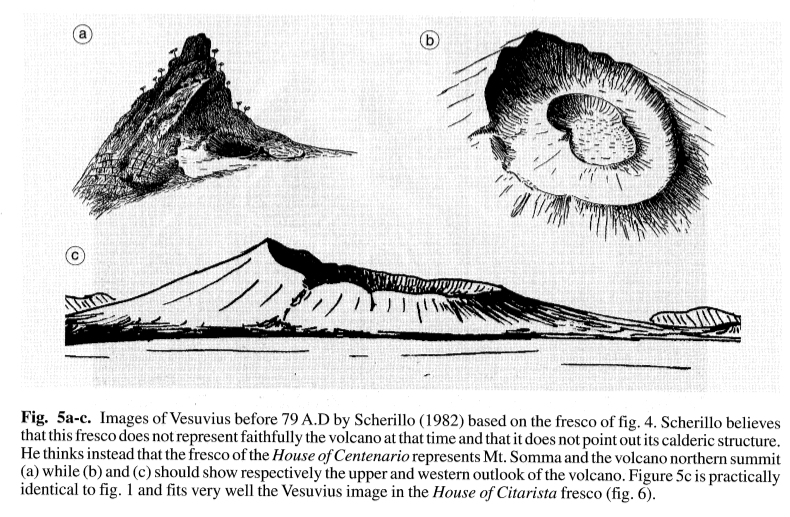 But all the other comparisons make me think of Vesuvius as a lower-end VEI6 eruption. 3 Icelandic volcanoes stand very close to the ocean. Implying their magma chambers are just 10km from the ocean. One is old Eyjafjallajokull, the other two are the violent Katla and Oraefajokull. Do you think that sea water plays a significant role in these two volcanoes? And considering that parts of Icelandic coast are just Holocene deposits from glacial floods and ongoing uplifting, I think that Hekla also once stood near the ocean waters too. Dunno if any of them are capable of opening their chamber up to the ocean like Krakatoa did. According to a paper I read somewhere, one of the active vents there was low, down near the coast. I imagine that when the island subsided a bit, that vent went fully underwater. Krýsuvík is reasonably close to the ocean as well. What if a rifting event started on land and then opened into the sea? Tambora is close to the sea but, as far as I know, sea water played no part in the eruption, except for the resulting tsunamis. The ocean typically only affects volcanoes which started as submarine (like Krakatoa) as far as I understand. Irpsit, Hekla is much too young for that. In volcanic lands (Vesuvius might also be the case), there is considerate deposition of ash by the coast from a volcano, raising the land by many meters. So Vesuvius might have been by the coast in the past at some time. You would be surprised to know how far inland was the sea in south Iceland back in early Holocene, because most of the SISZ region west of Hekla, is just deposition of ash by Katla/Hekla/Veidivotn, lava fields from Thjorsáhraun massive eruption and deposits from glacial floods from Katla, glacial river deposition from Langjokull and Hofsjokull and rapid land uplifting. Vesuvius is apart of the bay of Naples system from way back ? I don’t know but probably a long time back. Sea level is pretty high at the moment compared to the past half a million year, as we are in an interglacial. The extra 10 meter or so we will get in the next 2-3 centuries won’t reach Vesuvius. It seems that there was a rise of the land near the coast in the few years before the 1631 Vesuvius eruption. The whole area is prone to up and down motions as magma and water moves around underground. The next Vesuvius eruption may well start with such an event, giving us a few years notice. At the moment Vesuvius seems dead as a dodo though. If there was a very large eruption (VEI 6+ to 7), the sea could play a role similar to what it did at Santorini and Krakatoa. But as Albert points out, Vesuvius does almost nothing except the odd earthquake at the moment. Absolutely nothing of note since the 1996-99 unrest. has anyone noticed this? very very deep and a M2.4 while at it. Yes it was noticed and commented upon by Ian and irpsit a few posts back. I find the depth and size very interesting. I’d wondered about this one, too. Nothing (to my eyes) showing on the tremor guages, but would we expect to with such a deep earthquake? Probably not, at least not without a significant swarm. With that said, this is very interesting. The Katla volcanic system has been having occasional deep quakes in the last year or so, which I don’t personally remember seeing much of in the previous years. I don’t have quake data, so that could just be recency bias, but I would believe someone in here has data for historical Katla earthquakes which could shed light on deep earthquakes over time. Something to consider is that the deeper you go, the less brittle rock is since the increased heat makes rock much more ductile and “plastic”. The decreased brittle-ness makes it more difficult for earthquakes to occur, so a 2.4 at this depth is probably a good deal more significant than a 2.4 at a shallow depth. Personally, I think this is the start of the far-out run up to an eruption, although we may not see anything for another 4-5 years. If Katla has a major eruption (which is highly probable), do you think it’s more likely to be a VEI5 than a 4, since it’s been dormant for so long (and it hasn’t had a 5 in 260 years)? I would say we’re due a 5 somewhere in the world in the next few years because there hasn’t been one in 25 years, Katla seems a reasonable candidate. Based on historical data, the odds favor a VEI-4, but anything is possible here. If you look through past eruptions at Katla, it has had large eruptions after a small repose time, and small eruptions after long repose times. There may be a slightly larger than normal chance that a VEI-5 occurs, but I wouldn’t bet on it. Also, it’s current dormancy is still within a reasonable time period for repose, although it is *slightly* past the average eruption time, but yet at the point of being an outlier in terms of repose period. Something I’ve seen mentioned regarding Katla a few times is that it has multiple magma chambers (or really, magma pockets), so any potential eruption could be very dependent on which region gets activated. I’ve personally noticed two separate areas that seem more active, one being in north-central region of the caldera, and the other being in the south east region of the caldera. For whatever it’s worth, if we were to see an incoming eruption at Katla, it will likely be very obvious. We know from past history that Katla gets very noisy before it erupts – I would expect a ton of earthquake noise that is very obvious, similar to Bardarbunga in 2014. Side Note; Volcanoes are generally pure chaotic systems, they don’t do schedules. Don’t know how much warning Katla would give. It might depend on where the eruption was (in the caldera or outside the caldera). Her lava types cover the range from flood basalt to rhyolite, and include andesites. Most likely she would give warning but could she also do a Hekla? I think Katla will do a VEI5. At least Hekla has a very good correlation of size of eruption and how long it has been since the last eruption. Hekla usually does a VEI3 after a decade or two, a VEI4 after 50 years, and a VEI5 after a century or two of repose. Katla has done powerful VEI5 eruptions in the past, like in 1755. So it shouldn´t be underestimated. Why VEI5? Based in historical data, I think the intensity should be somehow smaller than Grimsvotn 2011 but sustained for a longer period of time, like a month. When new magma comes to Katla at deep, then we should see significant GPS inflation which will increase until shortly before the eruption. We havent seen that yet. But the deep quakes yes. I remember back in 2010 and 2011 I said Katla would not erupt due to a lack of deep quakes. Now we have them, but still not enough yet. When swarms of deep quakes start, then its getting really close. Karen, I think Hekla and Grimsvotn warn little, because they have very frequent eruptions, hence no need for magma to break that much of rock. I would bet that Hekla was more noisy back in centuries ago, when it would erupt every 50 years or so. I think Katla would be noisy like cbus suggested. Back in 2011 tiny eruption or whatever happen, it was very noisy. It should be likewise before a major eruption, with swarms of deep quakes as well. And of course technically Katla could sleep for hundred years, as its neighbours Eyjafjallajokull, Torfajokull and Tindfjallajokull also do that. However, as Eyja erupted in 2010, and Westman Islands back some decades ago, I would think that adjusment needs to occur at Katla as well. In the end, it all comes down to plate tectonics and rifting. In Iceland, some regions really go through cycles in activity. Sometimes Vatnajokull (Grimsvotn and company) can be relatively quiet for a few centuries, while other parts of Iceland are very active (like Reykjanes). This happened 1000 years ago. Then things changed. Or to cite Geolurking. Volcanoes are chaotic systems. But they do seem to have some strange attractors and patterns. irpsit, think the level of pre-eruption “noise” will depend on the type of eruption. Not seen any reports of large or felt eqs preceding the 1918 eruption (not that I’ve looked that hard). It is feasible that there is magma already at shallow depths under Katla. She has had recent jokulhlaups; small swarms; and, deeper quakes over a period of time. And the enigma of Escambia County. Based on cursory observation, I think our buses are volcanoes. They don’t seem to follow a schedule either. And also like a volcano, they tend to wind up in the way whenever you see one. Karen, the best information is historical reports written in Icelandic, and usually only available in Iceland and so difficult to know of. In Reykjavik there is a cafe that I recommend everyone to visit, its called volcano cafe (no joke, its really called that way and open *after* our blog was created). There one can find English books with historical reports of Icelandic eruptions. Let´s notice that M3 earthquakes are not clearly felt not even in Vik, the closest town to Katla, I think that many M3 earthquakes might have happened before (like in 2011) without the population feeling anything. Nowadays we would record that as very noisy. The same thing happened before the large eruption of Hekla 1947. Earthquakes were felt in Reykjavik. Both eruptions were pretty big and were clearly heard across large parts of Iceland, something which contrasts with Grimsvotn 2011, which was not. But still both volcanoes have done larger eruptions in the last centuries. Irpsit, that ties with the account in “Iceland”, Thordarson & Hoskuldsson, 2002. They say that a sharp earthquake was felt in Myrdalur at 1:00pm on 12 October; two hours later a 14km high eruption column was seen and the first jokulhlaup occurred. Would a mag 5 be described as sharp? Or would it more likely be a be mag 4 / 4.5? Notice Edlgjá eruption in the year 934 was larger than Laki and Veidivotn, according to this study. 19km3 of lava flows, across a 75km rifting fissure, and 6km3 of tephra (VEI5). Simply astonishing. Also notice the cyclical evolution of magma chamber of Katla, which correlates to frequency of eruptions. As the system evolves eruptions become more frequent, until a chamber develops and eruptions become less frequent again and culminate with a large lava flood, then the cycle restarts again. After the 934 eruption, we are now in the beginning of another cycle it seems (with less frequent eruptions over the past 1000 years as compared to previous millenia), and if this is correct a repetition of Eldgjá seems highly unlikely. But eruptions will get more frequent in the next millenia. Anyways what surprises me with Katla is that it always erupted (in the past 20 eruptions of the past millenia), in a period between May and November, and most often in late summer and early autumn (July-August to October-November). Also the period where Katla exhibits more seismicity. That period is now. So heads up to Katla again. Could that be, cause the normal summer quakes, even though they are very shallow etc, cause shocks to go down into the ground, sort of kickstarting the whole shebang? 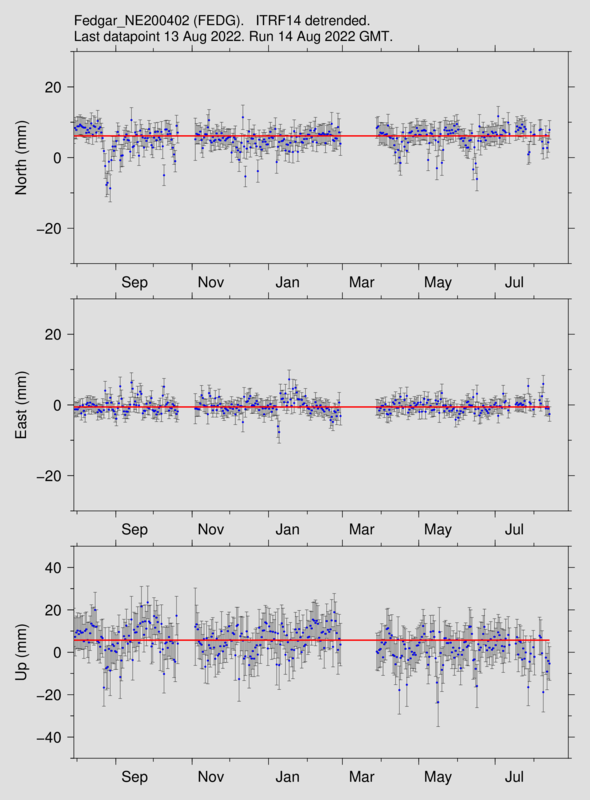 Seasonal variation in the thickness of the glacial sheet. 595 km^2 (1980) means each 2 cm of glacier thickness corresponds to ~0.01 km^3 of ice or ~9,000,000 tons. Ahum. 595 km2 times 2 cm is 0.01 km3 .. Sorry, my baaa-ad! :O Does not having slept for 29 hours and driven some 600 km through the night constitute an acceptable excuse? cm? What are the other dimensions? Note that this is 2cm of ice. It corresponds to perhaps 20cm of snow. ice is not much diverent then crust. How would a 2 cm change of thickness favour a eruption if you think of km’s of crust thickness? the weight difference is insignificant compaired to the crustal layer. Pressure doesn’t care about weight in total, just weight per surface area. In my very humble opinion the seasonal effect can only be due to water seeping down to the magma rich areas. 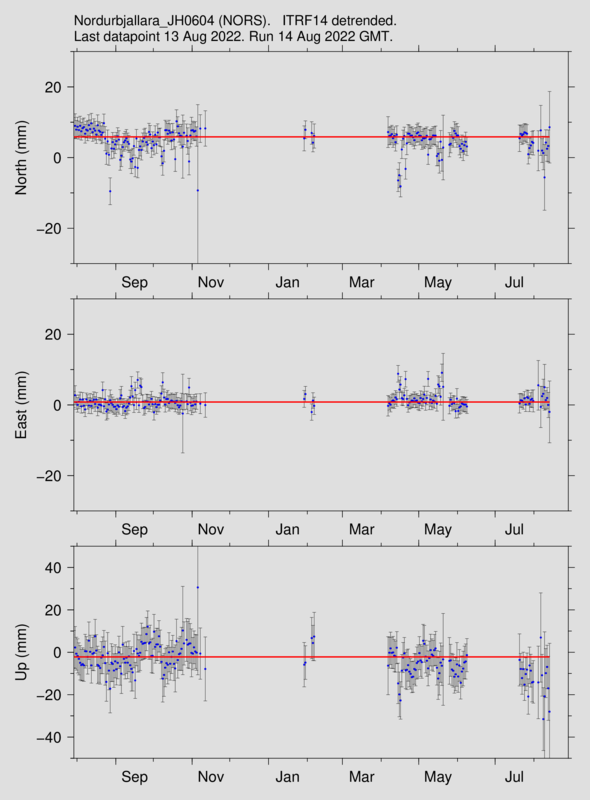 Anyone notice the small S/W movement on two of Hekla’s GPS meters? “New” post, the first of a series of re-posts, is up!